When I first glimpsed the darkish yellow bird feeding in a jabin or habin tree in Aqua Parque, I knew it was too big for a Yellow Warbler. But close looks at the bird escaped me. In my mind’s rolodex perhaps it might be a female Summer Tanager, but then I saw a black bib. 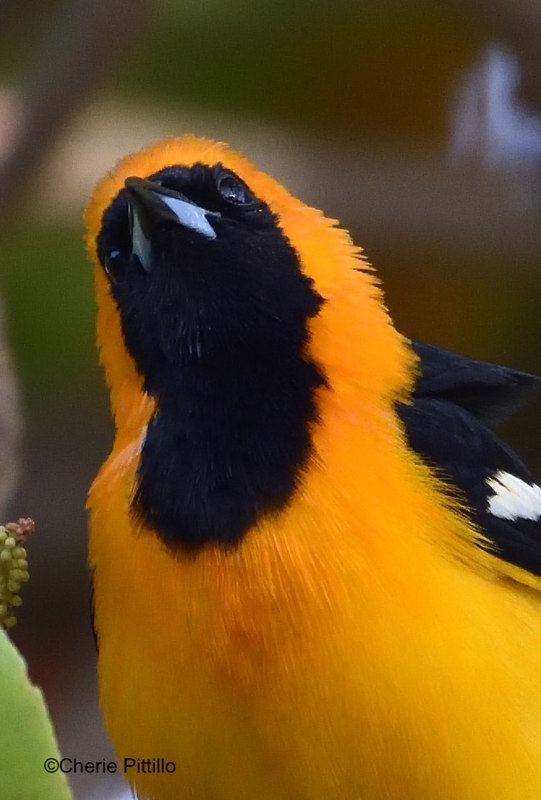 That reminded me of a Hooded Oriole. 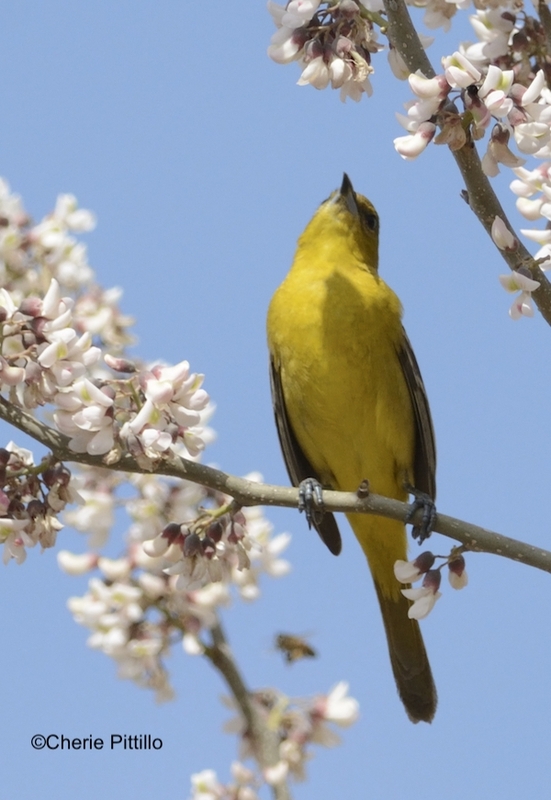 Then I saw a different yellow bird without the black throat flitting amongst the flowers, but it looked too small to be a Hooded Oriole. 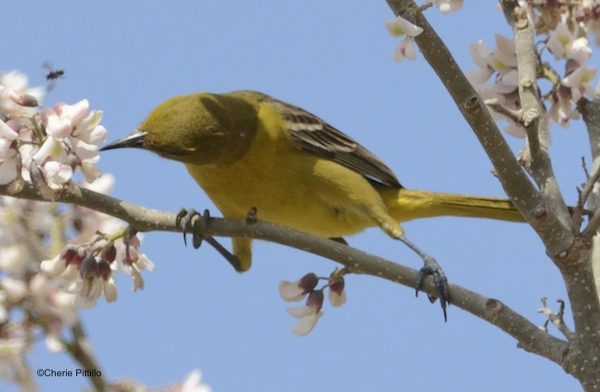 When I asked my birding friend about it, she said it was a female Orchard Oriole. I actually told her it didn’t look like one. Well, I was wrong. And the first one with the black throat was also a different age of an immature Orchard Oriole male. Upon closer observation, the feeding behaviors and their plumages intrigued me. 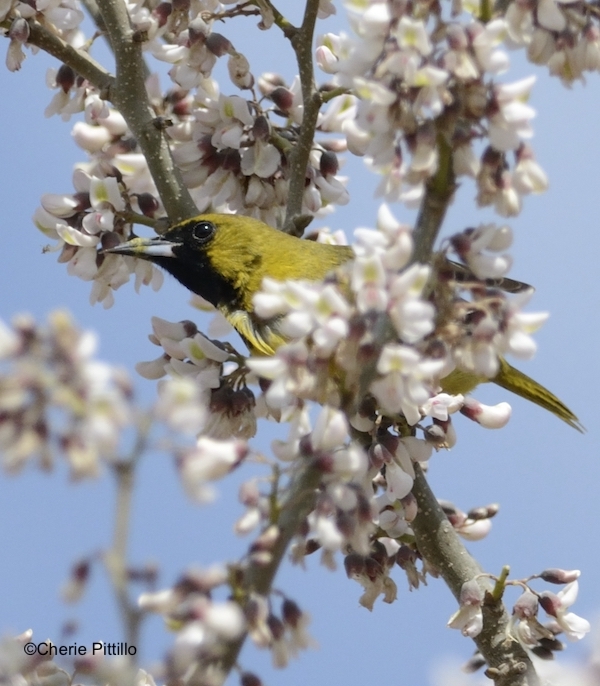 This small flock fed on tropical flowering trees, but I also realized pollen could be transferred from feathers and bills to the next flower. 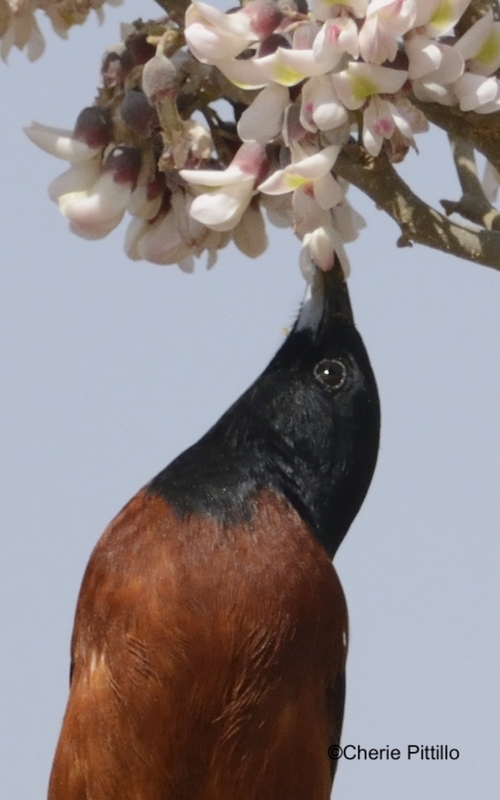 Note the yellowish pollen grains on their bills. We often associate hummingbirds with nectar feeding and even offer them sugar water in hummingbird feeders. But do we also think about how hummingbirds are pollinators too? And do we realize that other bird species do the same? 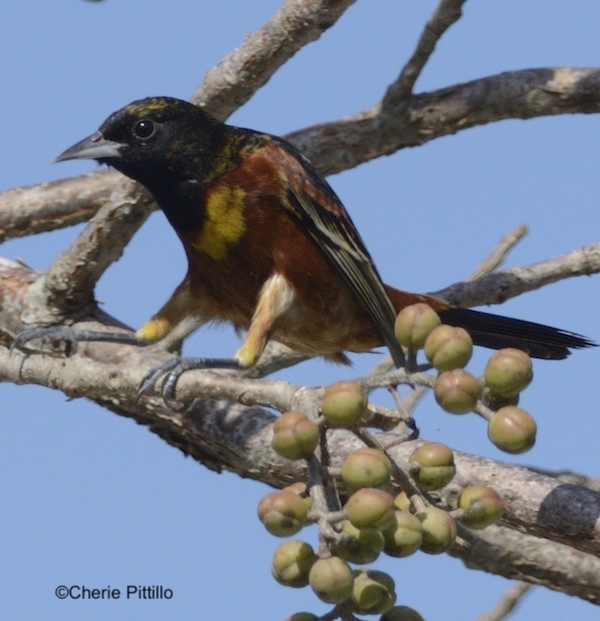 Research indicates that male Orchard Orioles seem especially attracted to the coral bean tree (Erythrina fascia) and may have co-evolved with it. It is the main pollinator for this species, however, it consumes nectar from a variety of plants. Some it pollinates; others it pierces the flower base only and misses the pollen. In some flowers, nectar, that sugar-rich liquid, mainly contains sugars along with amino acids, proteins, salts, and oils. 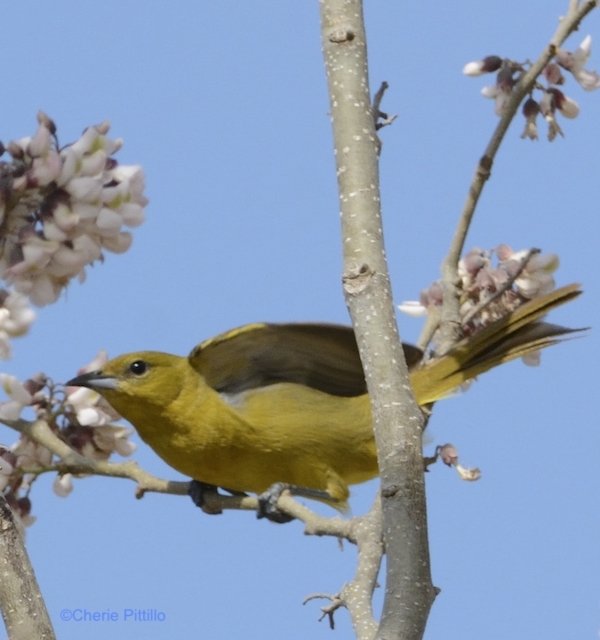 As the smallest of all oriole species, the Orchard Oriole gleans insects and spiders from foliage but shifts mainly to fruit before fall migration. In Central America it winters on berries and other fruits, nectar, and pollen. As a Yucatan winter resident, it visits Sept. to mid-May before returning to the US and Canada. 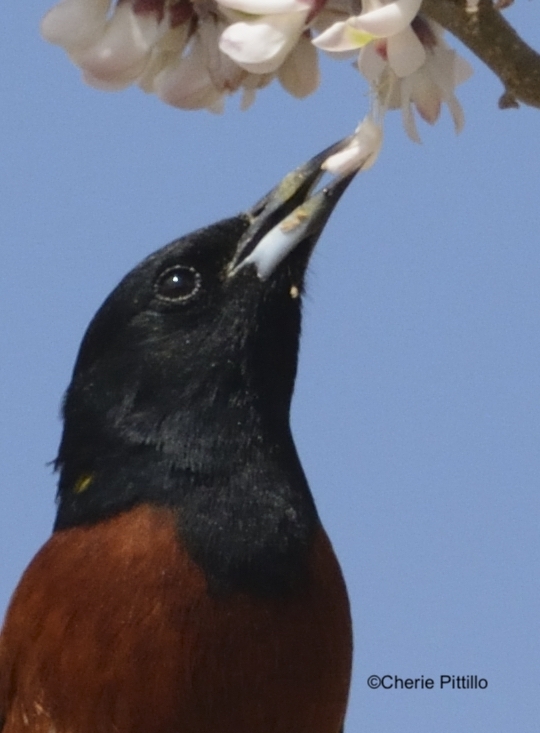 How happy I was to capture part of this feeding behavior as well as learning about the different plumages of the Orchard Oriole, an orchard of colors!